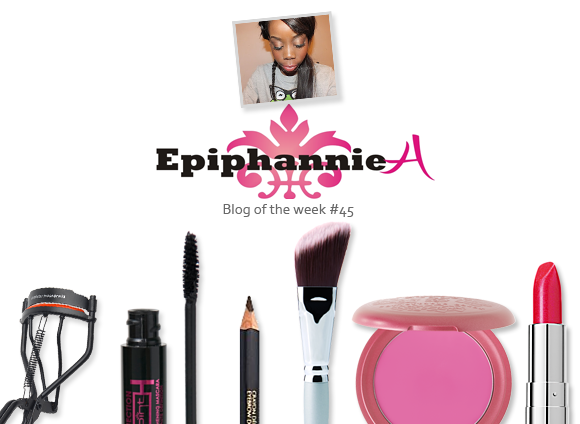 This week’s blog of the week goes out to Epiphannie (awesome name) of EpiphannieA, a hilarious blogger whose rambles have kept us in good spirits all week here at Escentual HQ. EpiphannieA is an eclectic blend of fashion, beauty and a bit of music thrown in for good measure. The content is really engaging and the pictures are suitably lovely, but it’s Epiphannie’s quick witted sense of humour that really captures your imagination. I especially love her Bucket List (I’ve always wanted to shout out ‘I object’ in a courtroom, too). I may be a teeny bit biased, but another favourite post is the review of the Daniel Sandler Watercolour Blushes. While there are plenty of pictures of the colours available out there in the blogosphere, swatches on darker skin are extremely thin on the ground. Epiphannie gives a really thorough review and includes lots of big, clear pictures of the blusher’s effect on the skin. This entry was posted on Friday, November 11th, 2011 at 9:06 am and is filed under Blog of the Week. You can follow any responses to this entry through the RSS 2.0 feed. You can skip to the end and leave a response. Pinging is currently not allowed.